The Nikon Coolpix P600 is a state of the art Nikon that precedes the Nikon Coolpix P510 model but is just a slightly different design with similar features. The main difference between the newer P600 model and the older versions is that it is marginally larger. This does not seem like a huge alteration, but it helps the user handle the camera easier and capture those shots as easily as possible. The Nikon P600 costs around and really can only be found used today. The following in-depth review will assess this product’s value, specs, price, comparison to other similar products and more. We hope that this review of the Nikon Coolpix P600 helps you determine if this specific product is the camera meant for you. The Nikon Coolpix P600 is packed with the newest technology paired with Nikon’s well-versed camera engineering. The manufacturer has discontinued this versatile camera so it can only be found used. The Coolpix P600 is great when talking size, takes amazing photos and is made with a genuine NIKKOR glass lens. The Nikon Coolpix P600 is a 16.1-megapixel digital camera with a 60x Zoom NIKKOR lens and Full HD 1080p video capabilities. The camera boasts a simple and user-friendly point and shoots option with its Scene Auto Selector that works great even in low light. A huge plus of the Nikon Coolpix P600 is the WiFi compatibility with your smartphone to automatically download and view your images. Use the camera’s Dynamic Fine Zoom to get even closer to your subject and the target-finding Autofocus for accurate and smart autofocus. The camera also offers full manual exposure to control the vision you wish to see in your image. The Nikon Coolpix P600 is a perfect super zoom compact camera for those looking for a versatile but extraordinary camera. The Nikon Coolpix P600 is a very user-friendly camera that could please both a keen camera enthusiasts as well as a Nikon newbie. This specific Nikon model offers an easy Auto mode for those who love using the point and shoot option, which is a very lovely option for those quick shots you just cannot miss. We love that the Nikon Coolpix P600 has been outfitted with a 1/ 2.3 inch backside illuminated CMOS sensor and a Nikon branded 60x zoom fixed-mount lens. The Coolpix P600 features a very similar looking design of its predecessors with the extra ability to get closer, faster from wide angle to ultra-telephoto. The Nikon Coolpix P600 flaunts a shockingly fast lens with maximum apertures of f/3.3 at 24mm and f/6.5 at 1440 mm. However, the lens cap does need to be removed in order for the camera to power on. You can hold down the playback button to power on the camera without removing the cap so that you can scroll through your images and videos without removing the lens cap. The Coolpix P600 features the famous Nikon Vibration Reduction (VR) image stabilization system to prevent camera-shake and letting the user utilize shutter speeds up to four stops slower. The VR image stabilization definitely allows for much sharper image and clear, precise shots. It is suggested that when using the VR mode, do not use it on a tripod because it will cause blur by trying to make up for the camera shake that is not present. The Nikon Coolpix P600 allows the user to take images in two different ways, which a lot of users really enjoy about this specific Coolpix model. You can use the eye-level electronic viewfinder or by looking through the rear screen. There is, however, no way to switch easily between the two due to the lack of eye proximity sensors but there is a button to toggle between the two options. The Coolpix P600 features a conventional zoom method with a lever that surrounds the shutter release button on top of the right hand grip. The lever is dual-speed and can rotate either direction to adjust the focal length while also rotating the lens fundamentals so you can set the wanted focal length more accurately. You can use the innovative side zoom control on the lens barrel to which can be used with your left hand. The P600 layout is very similar to that of the P520 model that it precedes. You get the top-mounted dial with the typical P, A, S and M shooting modes. This is ideal for those who love to manually shoot their pictures and have full control. There is also the full auto mode, scene auto selector mode, night landscape and landscape modes. You can also use up to nine different special effects when using the P600. You can also save your favorite settings by using the U (User) setting and quickly access it through this feature. The focus abilities of the P600 include Autofocus, Macro, Infinity and Manual. You can use a center-spot, a user selected ninety-nine-focus points option or camera selectable from nine different points of focus. This camera offers outstanding auto-focus speed, except for in cases of fast-moving subjects. The camera also daunts a manual pop-up flash that can be utilized by pressing the button on the side of the mock pentaprism housing body. If we take the Nikon Coolpix P600 and compare it to some other reputable cameras within a similar price range, we find that the Coolpix P600 is an optimal choice when set against its competitors. Let us take a closer look, shall we? 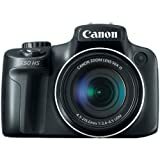 Let us look at the Canon PowerShot SX50 HS, Canon’s iconic digital camera packed with tons of features you can buy used for around $250.00. This camera features a vivid 2.8-inch Vari-angle LCD with 461,000 dots plus electronic viewfinder and takes 12.1 megapixel images with its high-sensitivity CMOS sensor and DIGIC 5 processor. As far as zoom abilities, this PowerShot SX50 HS has 50x optical zoom (24mm-1200mm) and 24mm wide-angle lens with Optical Image Stabilizer. 16 million effective pixels 1/2-inch EXR CMOS processor with primary color filter and lens shift image stabilization. Let us take the Fujifilm FinePix HS50EXR as another competitor’s example. The Fujifilm FinePix HS50EXR features a tilting 3.0-inch TFT color LCD monitor and electronic viewfinder with a very handy eye sensor. There is a 16 million effective megapixel ½-inch EXR CMOS processor with primary color filter and lens shift image stabilization. The lens offers a 42x optical zoom with approximately 84x with 42x optical zoom. You can also film 1080p Full HD movies with stereo sound with the Fujifilm classic. The Nikon Coolpix P600 is a wonderful option if you are looking for a versatile and reasonably priced camera with impeccable zoom and built-in WiFi capability. This camera offers a travel-ready camera with a NIKKOR glass lens optimal for telephoto zoom with its 1440mm capabilities. The camera features much better WiFi functioning than the last model, which is wonderful feature. The longer zoom definitely sticks out as the main pro of this P600 Coolpix model because it offers a super versatile super-zoom package. Cons of the Nikon Coolpix P600 include needing to use a tripod for most maximum telephoto and sharper pictures. The continued low quality of the EVF makes it also very difficult to stabilize the camera. The P600 does not, however, offer the integrated GPS system the P520 model offered. After considering all the aspects of Nikon’s Coolpix P600 camera, it is safe to say this camera is a huge bang for your buck. If you are looking for a quality camera with wonderful super-zoom capabilities and WiFi capabilities, the Coolpix P600 might be the choice for you. The camera offers a versatile and compact designed, a dedicated command dial, an incredibly accurate WiFi system with manual and auto modes. Both well-versed photographers as well as complete camera newbies can use this camera, which is why we love the Coolpix P600 so much. We give this camera an overall rating of 4.3/5 when considering its ease of use, features, design, image quality and value for your money.